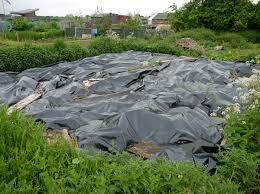 My wife and I have recently taken on an organic allotment plot to try our hand at vegetable and fruit growing. From what I have so far learned, I have been wondering whether plant growth might have something to teach us about the human side of life. What might be the deeper lessons in nature for us in our personal lives? The bane of all gardeners is the weed. 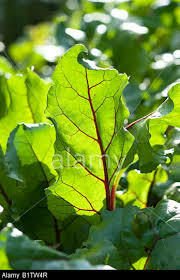 Covering the ground, it crowds out the vegetable plant, stealing both its sunlight and the nutrients in its soil. Everyone says one has to be persistent in noticing whenever these wretched things appear. 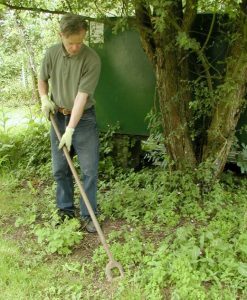 And keep hoeing annual weeds and digging up deeper rooted perennial weeds. Isn’t it the same in our private life? Bad habits of thought can easily take root in us if we let them. Our self-orientation attracts all sorts of these self-indulgent, envious or proud ways of thinking. Become too rampant and they are likely to choke out our better side. They have the potential to become the root cause of conflict, revenge, greed, and all the unhappiness. One needs to be constantly vigilant in turning away from such harmful thoughts. We took on our plot at the end of autumn and were told to focus on preparing the ground for the next growing season. This has meant enriching the soil with compost and well rotted manure. We’ve also put in some seeds of so-called green manure which after sprouting will take nitrogen from the air – another way of feeding the earth. In these ways the gardener hopes to foster vigorous vegetable plant growth and prevent plant disorders associated with malnourishment. I would say our minds also need nourishing. Parents give children many useful learning experiences. Teachers provide food for thought. Books can provide the reader with enriching experiences. Just as the plant cannot grow without nourishment from the soil, so also our minds cannot develop without knowledge about deeper matters gained from others. Overhanging trees, which cause shadow on the growing vegetable plant, are not welcome to the gardener. The reason is a plant needs light in order to grow. Photosynthesis is a process used by plants to convert light energy into chemical energy that can later be released to fuel the plant’s activities. We were advised to create pathways across the plot, rather than walk on and thus compact the soil where the crops will grow. Unlike on the vegetable beds, you can cover the paths with membrane and bark chippings to stop the light there and thus prevent weeds growing. Here then is another lesson from nature. The importance of light. No one wants to be kept in the dark about something. How could we understand what is going on? Hopefully, this article can help shed light on something for you the reader. Not everyone is willing to see things from a different perspective. But when new light dawns on something of personal significance, it can show us the way forward beyond our difficulties. It energises us with hope and opens up a new avenue. The gardener is aware that plant growth also requires warmth. He or she will protect against frost by covering the ground to keep it less cold ready for planting when the weather improves. Some seeds are germinated indoors or under cover for the same reason. Plastic cloches cover vulnerable plants to keep the cold wind off. Isn’t it the same with us? How can a tender mind flourish in a cold and bitter home environment? What person doesn’t need some warmth of affection or come into regular contact with warm-hearted neighbours, friends and work colleagues in their lives? Our allotment is on a farm with woodland to one side. With all those trees it is a natural habitat for birds and other wild life. Some plot holders use electric wires or high fences to discourage the badgers from eating their produce. 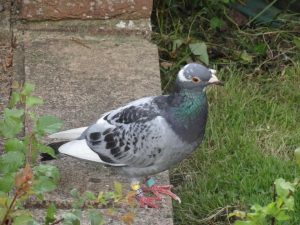 Pigeons will strip brassicas, fruit bushes and strawberry beds. Employing nets is a good idea to keep birds off as they soon become blasé about scarecrows. Some insects are also a pain in the neck. They tunnel into crops and feed on plant tissue and ripening fruit. It’s a good idea to encourage hoverflies, lacewings and ladybirds who feed on troublesome aphids such as blackfly and greenfly. Day to day life for us humans is also not without its trials and tribulations. The key to personal well-being is not the presence of difficulties but how we deal with them. One must do as the gardener and take active measures. How we effectively deal with pests in our day to day lives will vary but it will take an act of will and determination. Perhaps, facing up to worrying issues, fighting against what is wrong, or challenging certain noxious people. Our inner growth means being free from what is destructive around us. 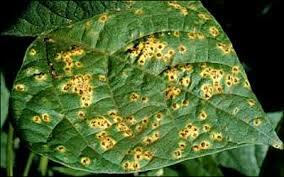 Plant diseases are shown by a variety of signs, including moldy coatings, wilting, scabs, blotches, rusts, and rot. They are caused by fungi, viruses and bacteria. 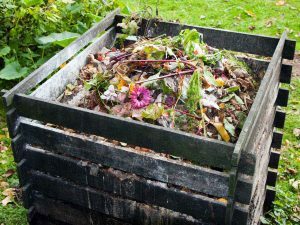 After, if possible, cutting off the diseased parts of a plant, the organic gardening approach is to keep the growing area clean; like cleaning soles of boots, tools, pots, seed trays. Plant debris are cleared away and any diseased material is destroyed. One of the reason for crop rotation is to prevent the build up of diseases as plants of the same family will suffer the same disorders. Just as a diseased plant cannot prosper, so emotional sickness can hinder spiritual growth in a person. In tackling plant disease the organic gardener does not use unnatural chemicals. In a similar fashion, states of depression, fearfulness, stress and depression can be reduced without resorting to artificial means; for example by clearing away harmful and irrational ideas, unethical thoughts or unhealthy fantasies from the mind. This is the opposite of the artificial approach of depending on alcohol, video games or antidepressants to reduce stress. The gardener has to work hard but in the end it is mother nature that changes seeds into crops for eating. Similarly, we each need to work on our personal growth. Yet, alone of ourselves we cannot bring to life what is good. The organic gardener co-operates with light and warmth to grow the plant. In order to cultivate our spiritual mind, we each need to co-operate with something beyond ourselves. I would suggest this is the light of wisdom and warmth of love that comes from our Divine Source. Previous Previous post: Scripture – Is it uncivilised dogma? Next Next post: Compassion – Where does it come from?